The Scots language has a rich tradition, and abounds with marvellous words. Each week this blog will show a different Scots or Gaelic word with its English equivalent. I hope that you will enjoy them as much as I do! I have lived on the east coast of Scotland for about 40 years, and am very familiar with haar. It is a thick penetratingly cold sea fog which rolls in from the North Sea, and can transform a bright sunny day into quite the opposite. It is not unusual for people to plan a day's outing for somewhere inland, rather than be disappointed by the haar. 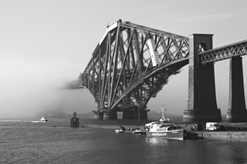 The photo shows the Forth Rail Bridge in the process of being engulfed by the haar rolling up the Forth Estuary from the North Sea.